We’ve not visited Tenerife before. Please could you recommend; should we hire a car; where we should stay and any long walks in that area? It’s a difficult question to answer without knowing your personal preferences. For example, the purpose built resorts couldn’t be more different from the historical towns or the cities. There are good walking routes near to most places but, generally speaking, the best walking is in northern and western areas. Have a look at our question and answers page which might give you an idea and then if you have any further questions, feel free to ask. I have just bought one of your guides. When can I expect to receive it? I’m leaving to Tenerife in a couple of hours so I’d be grateful if I could get it ASAP. I hope you got it on time Michal. The guide was sent before I saw this message. For anyone else who may see this comment, when you buy any of our guides there is an option of being able to add special instructions when you place the order. Part of the Los Organos path was closed last year because of problems with the state of the path. A couple of friends walked it in November, after it was closed, and although it was still passable, they thought it was quite dangerous. 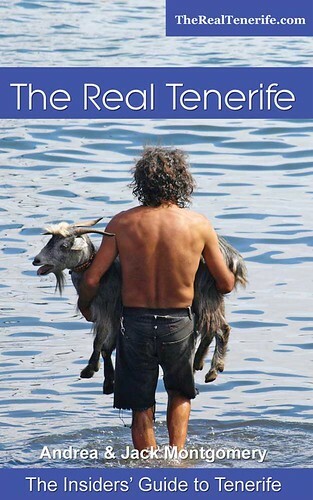 We’d hoped that the authorities would have fixed the issue given the first Tenerife Walking Festival was this year (just finished) but the official information shows that part of it is still closed. We’ve added an alternative new route to our walks which gives walkers very similar views as the Organos one but isn’t as vertiginous. Good day i am looking for 3-4 days hiking trip in canary islands end of october 2015! I’m intending to escape the coast with a 2/3 day walk, probably finishing at Los Christians, (or Playa las Americas). My idea is to go up from Santiago di Tiede and come down via Viaflor. I cannot find any walks which traverse this route. I was intending to sleep out (bivouac) for one or two nights, if necessary. This would take the time pressure off, and the necessity for a car. I arrive on the 15/1/15. Can you recommend any of your walks which include or would cover this intended line? Also which map would be best? Many thanks and best wishes for 2016. That’s an interesting route. Last year we actually looked at a similar route but going in the opposite direction from San Miguel de Abona above the south east coast to Santiago del Teide via Vilaflor and Teide National Park. We were putting together an itinerant walking holiday for UK walking holiday specialists Inntravel. In the end we decided against the link to Santiago del Teide as there was no natural link between the park and Santiago del Teide. There are trails everywhere, but as most used to be mainly trading routes or paths to move livestock between coast and sea they tended to go up and down or link communities so there was never any real need for a link between the Santiago side of the park and the crater. It’s a shame because it would be a very diverse route. You can get to the road through the park via Chinyero but there are no established paths from there linking that particular section with the routes to Vilaflor. For every other part there’s a choice of paths. Unfortunately I don’t think any of our routes would be much use as we tend to have circular routes where possible as most people who buy our routes get to the starting points by public transport or car. I’d recommend trying the Kompass map to piece together a route. It isn’t perfect (none of them are) but it’s not bad. Hope you manage to work it out and Happy New Year. Hi, could you tell me if the book ‘Walk this Way’ has the same walks in as the 7 Island Walks pdfs? Which resource would be more suitable for 2-4 hour walks in South and West of Island (we r staying at Alcala)? All the walks in the pdfs are in the guidebook, the book simply has more additional information about the island as well as a few walks not included in the PDFs. If you only want walks covering a specific area a couple of the PDFs would suit best. 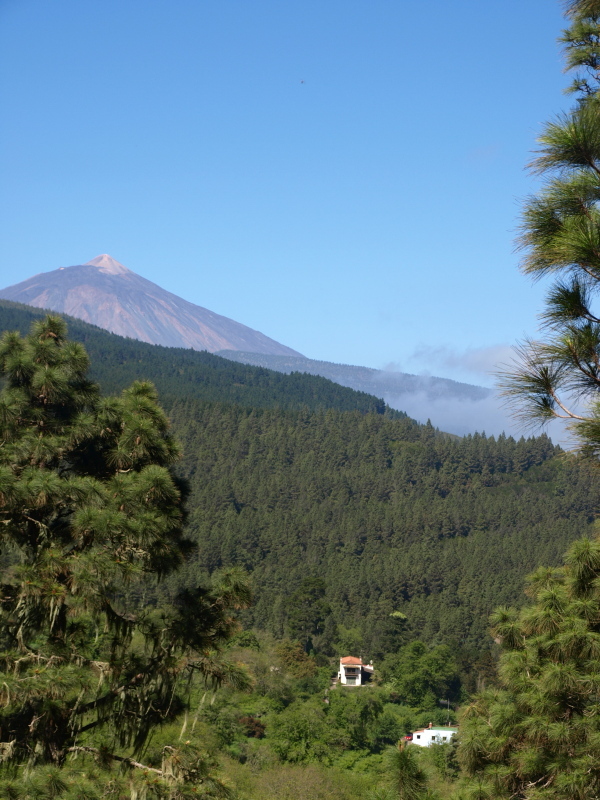 The closest to Alcala are the Into the Valley routes which are around Santiago del Teide which isn’t far inland from Alcala and includes a great walk which falls into the 2-4 hour category. Also the Lost Worlds and Lava routes are above the south west coast and all three routes are between 2-4 hours. 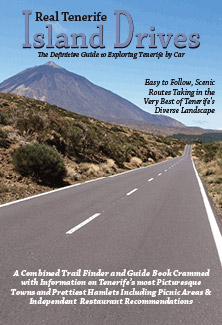 I am very interested in buying Real Tenerife Island Walks & also possibly Real Tenerife Island Drives. I am living in South Tenerife this year but do not have a printer to print off the walks & drives. Can I buy the books from a bookshop here? Sorry for the slow response Rosemary, we’ve been in the field, so to speak, for most of the last week. Both Island Walks and Island Drives are only in PDF format. We did stock a book version of the drives in shops here for a while but were unhappy with the organisation of distribution. 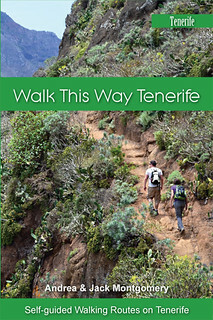 We do have other books in print form, including our walking guidebook Walk this Way Tenerife (a more comprehensive version of the Island Walks routes with additional routes and useful information) but these are only available from Amazon and other online bookstores. I am looking for walking guides for a beach to Tiede summit walk over a week in September 2016. Route starting at Masca valley. Hopefully avoiding road walking. I am an experienced altitude walker. The information available on line is not clear to me. I plan to use public transport / taxis to Los Gigantes hotel each day. It’s not an established route which is why you’re struggling to find clear information about it. Many of the best routes on the island have been around for centuries and existed for a purpose; however, the more personalised the route, the less information you’ll find. There are coast to Teide summit routes, but not from that starting point. We often piece together walking routes for various reasons and just about anything is possible (not without some road walking in the case of the route you want to follow) but these involve quite a bit of planning and testing to sew them seamlessly together. All I can advise is to get hold of a decent walking map and try to create the route you want on that first. Tenerife walking Maps aren’t perfect but they do tend to show where most paths exist. Having to return to Los Gigantes each day makes it significantly more complicated. The more rural the area the more infrequent the bus service so you’d probably need to come to an arrangement with a taxi firm in your resort. Can you tell me if GPS tracks are available for download for the ‘Walk This Way’ guide? There are some GPS coordinates for route starting points in the print guidebook, but that’s all. To be honest, although we use a Garmin to record routes we’ve not included them in the past because we believe it’s important the routes are more about descriptors and not reliant on GPS. But more and more people like GPS and in future we’ll be including more coordinates. We’ve just booked a week in January at Los Gigantes and would like to include some decent length walks from the resort. Will the Lost Worlds and Lava walking routes give us the info we need? Hi Jonathan and apologies for the late reply, I’ve only just noticed your comment. If you’re hiring a car then the Lost Worlds and Lava routes are certainly easy enough to reach. They can also be reached by public bus (we include relevant bus routes) but it would be a lot more complicated. 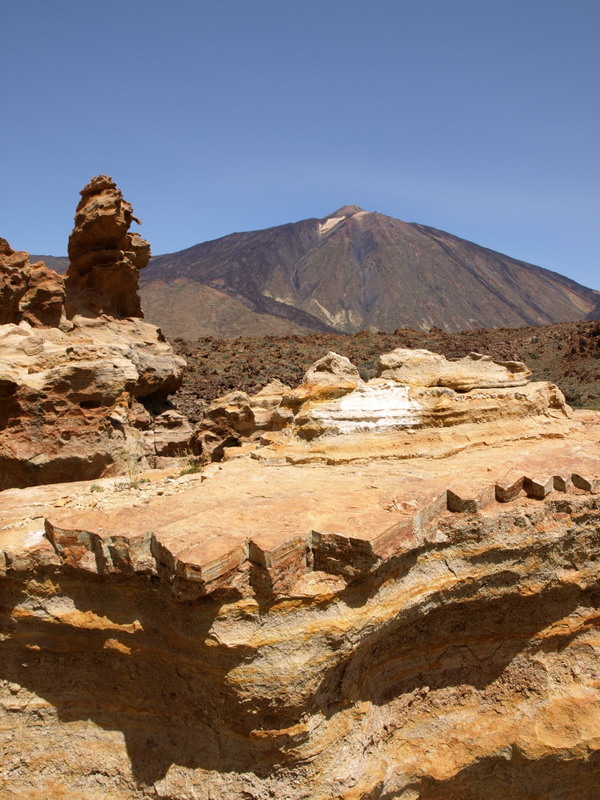 Easier whether driving or using public transport are the Into the Valley routes in and around Santiago del Teide which is about a 15/20 minute drive up the hill from Los Gigantes. 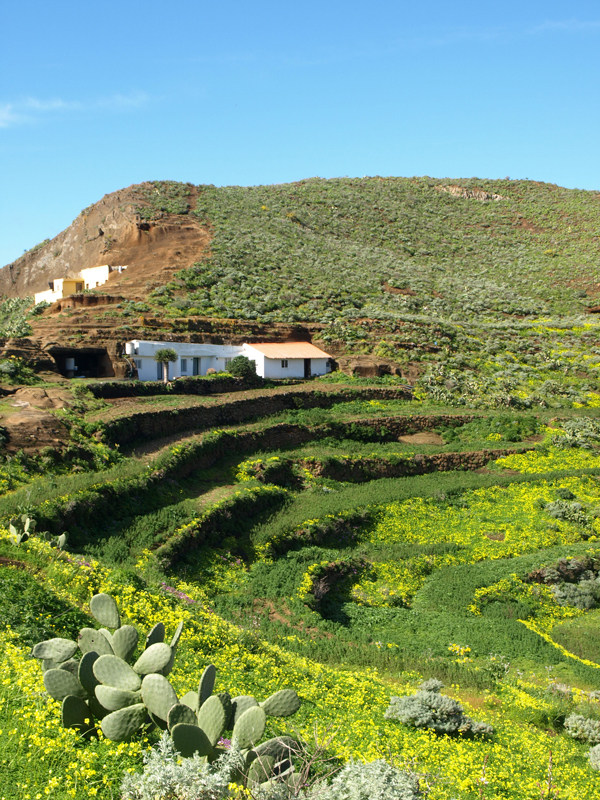 There’s also a direct bus service linking Los Gigantes with the Santiago del Teide area. Thanks Jack – Into the Valley routes map ordered. Thanks for an interesting and informational site! I’m going with a friend to tenerife in the end of Feb- beginning of March. We’re interested in doing some walks. We’re more into interesting plants and flowers and charming paths than peek views and altitudes. At this time of year- could you recommend which of your routes would be suitable? We lean towards staying somewhere in the north around Puerto de la Cruz. We tend to favour routes which are visually interesting in a number of ways because that’s what we like ourselves, so the northern ones especially include a variety of different plants and flowers. You might catch the end of the almond blossoming period in our Into the Valley routes around Santiago del Teide and possibly even the start of the spring wild flower season. Similarly our West World routes include some interesting fauna, especially the Teno Alto route. And walks in the upper Orotava Valley (Northern Exposure) are different again. 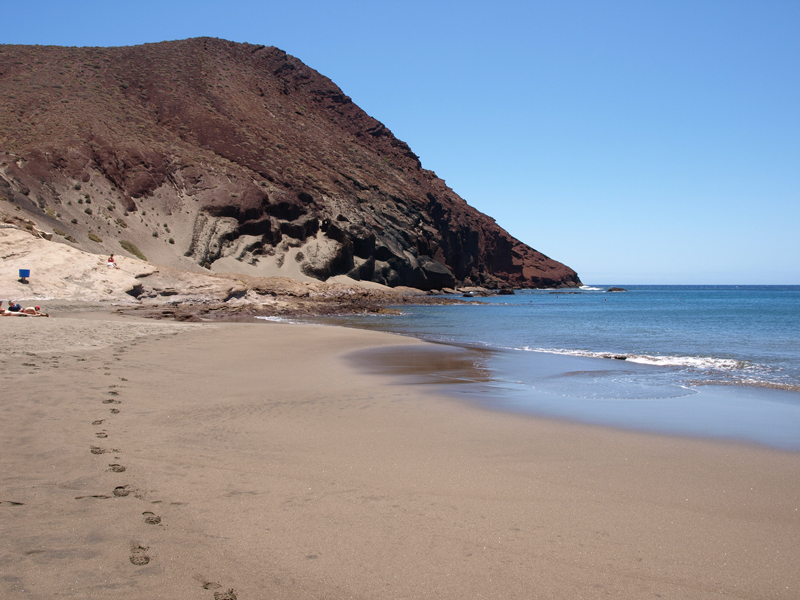 Puerto de la Cruz is the ideal base for anyone who plans on walking, it’s where the annual Walking Festival is based. I just paid for the hiking and the driving guides, but don’t know what to do next… Could you give me instructions? And using this opportunity, I have one question. I would love to spend maybe three days hiking in the north east of Tenerife, before driving down to the south. Could you give me advice as to where is a good place to stay and use as a base. 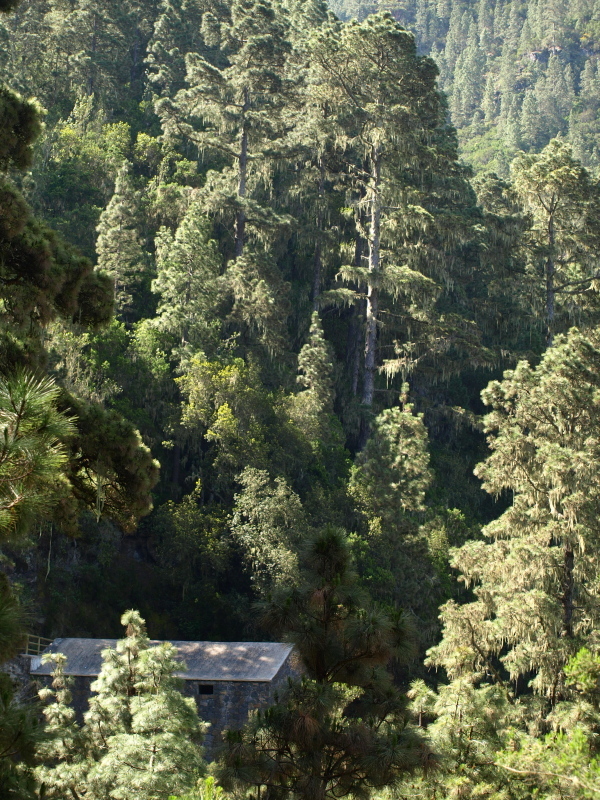 I currently plan to stay in La Laguna, and drive to the entry/exit point of hiking routes every day. Do you think this is a good strategy, or do you have a better idea? I am looking forward to reading! Thanks! Hi Makoto, you should have the guides by now. La Laguna is the best town base for accessing walking in Anaga as the main route into the mountains starts right from the outskirts of the town. There is also a hostal actually in the Anagas, Albergue Montes de Anaga, which is perfectly placed for getting to walking routes. Hope you enjoy the walking there, we always do. Hi, i just paid via Paypal but received no confirmation, is this normal and when will i get the pdf? Thanks! You should have received confirmation of purchase with an order number from Paypal. We’ve received notification and the routes have been sent to your email address. Btw hiking is best advised early in the morning I guess, to avoid the heat? Looking forward to discovering Tenerife off the beaten track! The guidebook isn’t in PDF format, sorry. But the range of PDF routes do cover most of the routes in the guidebook. Over the course of a week you’d be able to get in some of the best walking on the island just by choosing from those, obviously depending on where you stay, and can access. Setting off in the morning is always good advice for Tenerife, but by October you don’t have to set off too early. It’s a great month for walking as it’s still late summer warm, but usually not searingly hot. Hi Jack, bought you guide a couple of months ago. It’s awesome! Helped us out a lot to plan which hikes we want to do. I read online that there were problems with the Los Organos route. It was closed due to rockfalls, but now apparently it’s open again (though not officially?). Do you have any more information about this as I can’t find much online and I’d love to hike that trail. Reallly glad you like the guide. The Los Organos route is open – here’s an account of walking it from last April. 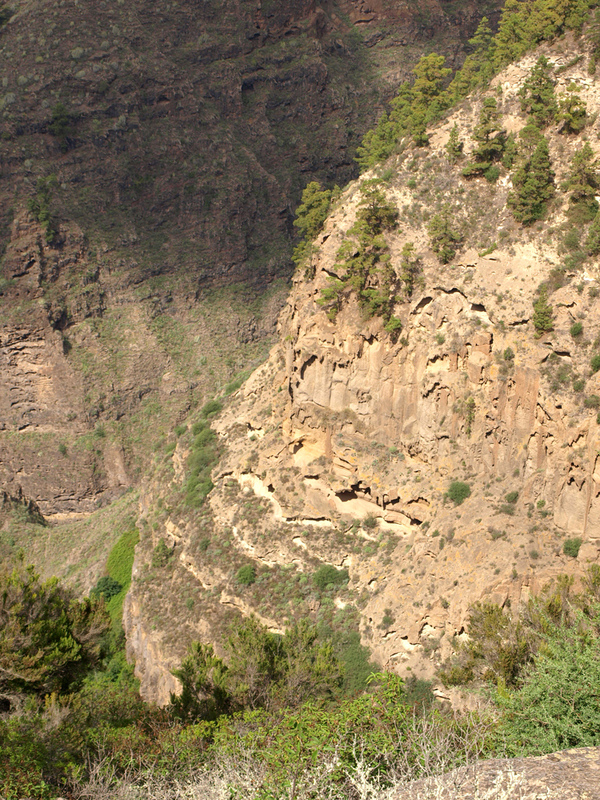 – The Barranco del Infierno : we felt it was a level 2 trail, only the warm sun might make this a level 3 trail. – Above the Barranco Del Infierno : nice easy trail, hard to get lost. – Masca Barranco : VERY nice trail, probably one of the nicest hikes we’ve done in a long while. Hard to get lost. – To the Hidden Valley of Las Fuentes : the trail itself is not that interesting, but the village of Las Fuentes at the end was very cool to see! – From the Forest to the Caves : we started in Punta Del Hidalgo, took the trail to Chinamada and were planning to go to Cruz del Carmen from there. Sadly we took the wrong path in Chinamada and ended up in Los Batanes (also a very nice hike). From there we followed the road to Cruz del Carmen to reach our pickup. There was a signpost in Chinamada saying Cruz del Carmen and only one trail that started there, so we still don’t know how or where we went wrong, just wanted to point this out for others to watch out for this. – We wanted to do the Los Organos route, but due to heavy rain ended up doing A Glimpse of Rural Life. That route was alright, but due to the weather we didn’t really have any great views. Sadly we couldn’t do all of our hikes due to the weather (El Teide was closed the entire week due to snow and temperatures well below 0°C), so we’ll have to go back at some point to finish those. – Los Organos : we had very heavy rain shortly after we started and decided not to take any risks. The views would have been poor anyway. – The hike up mount Teide : all routes to the volcano were closed, so we had to skip on this one sadly. – From El Palmar to Teno Alto : also couldn’t do this one due to bad weather in that region during our final days. – I’d also like to do another hike in the Anaga region, that was really pretty. So with respect to doing those remaining hikes, when would you suggest is the best month for those? An ideal hiking temperature would be below 20°C, no rain and clear skies. I’ve heard from people that april/may is good and also october/november. In your experience, when would you advise us to go back? Thanks! Many thanks for the feedback Filip, really useful. Unfortunately the bad weather which rolled in across the Canaries scuppered a lot of hiking plans over the last couple of weeks. We were also thwarted, having to cancel plans to check directions on a couple of routes. One of the ones we did manage before the snow and rain moved in was Las Fuentes. The prolonged spell of dry weather has left some parts of the south west looking not as attractive as they should at this time of year. We were also disappointed with how Las Fuentes was looking. Rain will transform it, but the authorities have also ‘tidied’ part of the route up, not improving it in the process. You were just unlucky with the weather, these sort of weather fronts will hit a couple of times during the season, you just never know when. Proximity to carnival is usually a good measure though 🙂 You can still get some rain in April/May but not the sort of weather you experienced on this trip. Spring is our favourite time for walking. 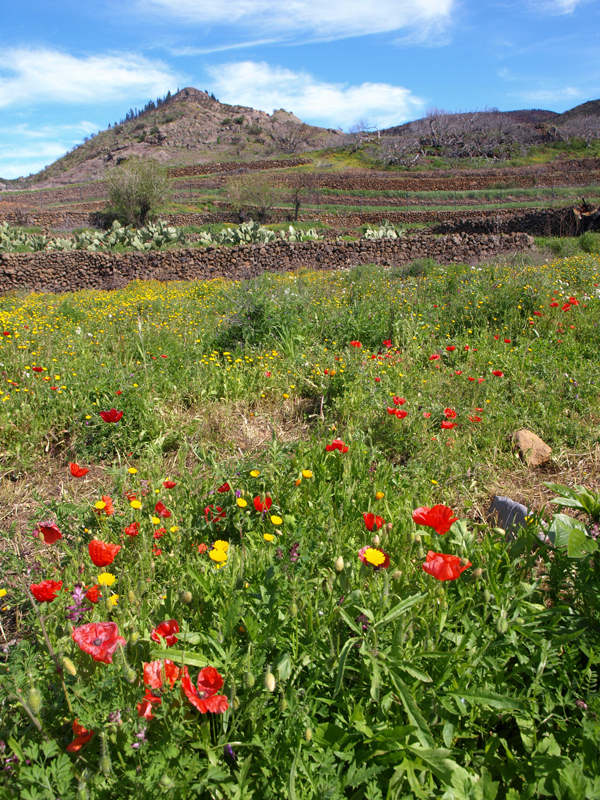 That Teno route is especially beautiful when the wild flowers are in bloom. October is also good, but can still be very warm. November can be dodgy. Could be perfect, but change of season heavy rain comes at some point. Most walking routes on the island are open, Masca is only closed because it’s such a busy route, and people were still attempting it under dangerous conditions (weather alert level wind and rain). There’s been a lot of injuries in the barranco because too many people aren’t suited to the terrain so the authorities are trying to make it safer. I’d recommend travelling a bit further into the Teno Massif and trying the Teno Alto route, it’s one of our favourites and at its best at this time of year… and you don’t get the Masca crowds. In truth there’s plenty, we only include routes we particularly like. Hope you enjoy the walking. Just to thank you for all the thought, care, hard work and passion that has gone into compiling your walk book. I have used it for two trips to Tenerife now, and have found the instructions to be clear and accurate (as are your observations!). 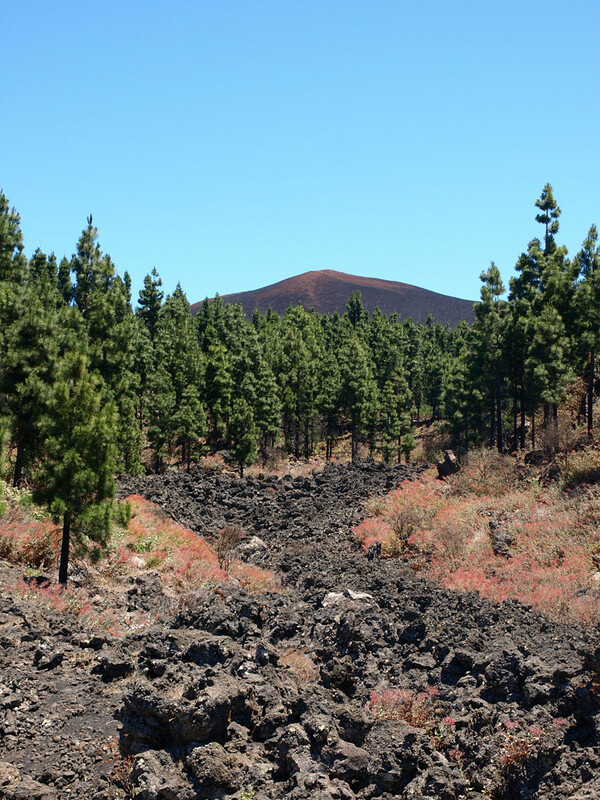 love the wilderness of Tenerife! Is there any chance of a Volume 2 for me to explore? Thanks for the well priced and great guide, I would recommend it for sure – even without detailed maps and GPS, we found all the trail heads trails as needed. One thing I would like to point out though, is that many of the trails in this “select” guide are HEAVILY used, some even require reservations and cost money. Having grown up in western Canada, hiking and camping, I am keenly aware of how we must all be stewards of our forests and trails. However, many of these select trails are just being hammered by tourists, garbage, faeces, etc. I think it would be great if the authors could help disperse this heavy use to other less used regions and trails by showcasing routes that are not so widely known. I think it may be worth the authors time to ponder their contribution to the overuse of these trails and instead help to spread out the impact and even add a few lines about clean and responsible hiking. Judging by the quality of this guide I am sure you would do a great job and it would be much appreciated by everyone. Happy Trails. Thanks for the feedback, it’s appreciated and you’ve given us a couple of ideas. I’d be interested to know which routes you walked? 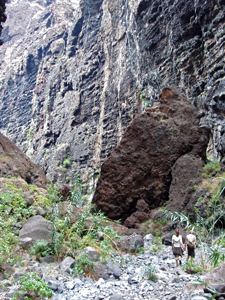 Currently there is only one route on the island for which there is a charge, the Barranco del Infierno. It’s not one of our favourites but it’s highly popular due to its proximity to the main resorts. The summit of Teide National Park requires a reservation, but that’s for conservation purposes so understandable. The only other route which requires a permit is in Anaga in the north east, but we don’t include that one. Generally speaking, walks which are easily accessed from the main southern resort areas tend to be busiest, with Masca being a particular example of a great route which is negatively affected by the amount of walkers, an issue we’ve written about many times. It’s recently been closed as a result of ‘hiker abuse’. But most other routes remain crowd free which is why we include them so I was really surprised at your comment that many of the trails are “being hammered by tourists, garbage, faeces”. That has not been our experience… apart from the ones mentioned above and a couple of trails in Teide National Park. Teno, Anaga, and the Orotava Valley, where our favourite walks are located, are too far away from the main resorts so don’t get the same volume of visiting walkers even in high season and we love walking in those areas because of that and because of their beauty. Again thanks for your comments – food for thought – and I’d love to know where you walked so we can look at those areas again. ¡Vaya!... ¡mira quién ha estado en GF Hoteles!